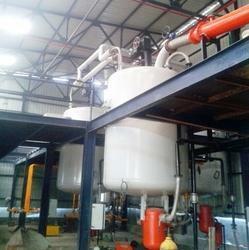 Manufacturer & Supplier of Lube Oil Blending Plant. Our product range also comprises of Used Oil Recycling Plant, Waste Oil Recycling Plants. Semi Automatic Batch Blender (Semi ABB) is perfect solution for Lubricant Oil Blending Plant for making large number of products. This supports any numbers of different Additives, Base oils and Viscosity Improver as input. The blenders comes with Load cell or Flow cell to measure quantities of raw material. The panel board with touch screen is provided to operate whole plant with least effort. Features: ABB Blenders comes with Load Cell or Flow Cell which makes it perfect in Blending Industries. Each blender is connected with Control Panel which operates all the Valves, Stullers and Pumps for Base Oil, Additive & Viscosity Improver. Also Indicates Flow/Weight of the fluid for measurement for Contamination. Operation: Using single Control Panel, user can select the Base Oil line and keep monitoring for Weight and Flow of The Base Oil, After then according to recipe again select the line for Additives / Viscosity Improvers and add it to Blender until it reaches to desired quantity, each of the contamination can be monitored by user with help of flow measuring device & live weight scale from Control Panel.